It’s not difficult to imagine the cheerful smiles of the Postelles adorning the walls of a fourteen-year-old girl. Not in the way that Justin Bieber or the Jonas Brothers festoon a tween’s binder. But they are the type of band whose lighthearted rock and happy-go-lucky image recall a more innocent time of do-it-yourself garage rock and boyish charm. 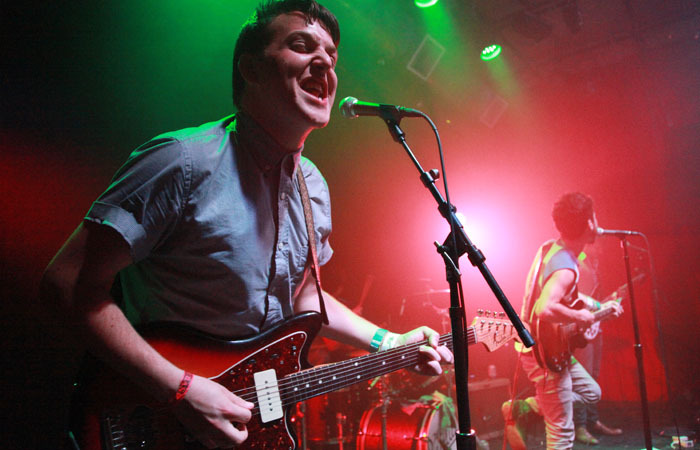 They exude a sweet nostalgia and last Thursday, the Postelles brought their brand of earnest, upbeat pop-rock to San Francisco’s Rickshaw Stop where youthful exuberance seemed to be the theme of the night. Enthusiastic teens, complete with branded X’s (for those underage) on their hands, drifted into the intimate setting of the Civic Center venue as part of Popscene — San Francisco’s weekly concert series oriented towards new, hip bands. With previous big names such as the Killers, Amy Winehouse and Vampire Weekend headlining Popscene shows, there were certainly big shoes for newcomers, NY-based the Postelles to fill. Only before they could come on stage, the audience had to endure an infuriatingly lengthy DJ set. For over an hour and a half, the nauseatingly catchy beats of Lady Gaga provided the soundtrack for what looked dangerously close to a middle school dance. The disco ball was there. Acne-ridden adolescents trying to get drunk but failing miserably were there. The youthful vibes were numbingly infantile instead of wistfully wholesome. Not to mention the fact that, just like a middle school dance, there was virtually no one present — only two drunk girls in Uggs (a common feature of every dance). Not until near midnight did the floor start to crowd. With the two tipsy teens in front (naturally), the Postelles burst on Rickshaw’s compact stage with a guitar-heavy gusto that blew the roof off the middle school malaise that had set in. Though they only played a 30-minute set, the Postelles proved themselves as dynamic, capable musicians despite a somewhat lackluster debut album. Outside the confines of the studio, the band let loose and let rip some genuinely rockin’ tunes. On songs like their popular single, “White Night,” the riffs were raw and the beats were infectious. The band was having a gay ol’ time and those young whipper-snappers in the audience ate it up like toddlers in a candy shop. Despite the dreary lull of the opening DJ, the Postelles short-lived set uplifted and enlivened what would otherwise be thought of as tried-and-tired material. It was somewhat endearing to see the band, at the start of their career, with eyes as wide-open and optimistic as the crowd (especially the girls) they wooed. By the end, when lead-singer Daniel Balk invited the many howling girls onstage, it was clear that the Postelles had brought the party.